The Goat Man encounter and inside the Zone 18 ghetto in Guatemala City. wow thanks for sharing!! such a contrast btw the house you stayed at and the homes that were formerly a dump site. reminds me of the "squatter cities" in manila and jakarta - traveling and seeing those places is truly humbling esp since the people u meet there are some of the kindest and most generous in the world despite their poor living conditions. The videos just keep getting better and better. 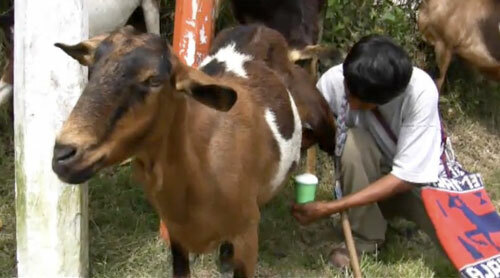 I loved the two shot of you guys drinking the really warm goats milk. Journey Safe, my friends! The videos have been better than anything on TV, that's for sure. Wow! I love the videos! So very awesome. Sam, I got so happy when the little girl wanted you to lift her up and then you finally did! I felt all warm inside. I hope to be able to do something like this someday. It seems like an experience of a lifetime. Keep safe and enjoy every minute guys! You guys are ballers and this website is outstanding. I had a blast visiting Lake Atilan with you and look forward to the dance lessons next week. Vaya con Dios. You guys are doing great with vids and photos! Fantastic job! We wish you both best of luck and as many cheap plane tickets as possible! william - shouldn't you have a manly beard by now. i think so. dang. you guys are so awesome with this video/subtitles... :) it made me smile!!! those children are so precious.. its nice to know that you have such a big heart for them :) thanks for putting that up there. This is a really unique way of sharing your trip and I am loving it!